I just recently found your blog and wanted to get some advice. I am an extreme novice when it comes to cooking/baking but I am trying my hand at different things. I have even taken cooking classes and found that I love it! For Christmas, I wanted to make different candies, fudge, caramel sauce as gifts. 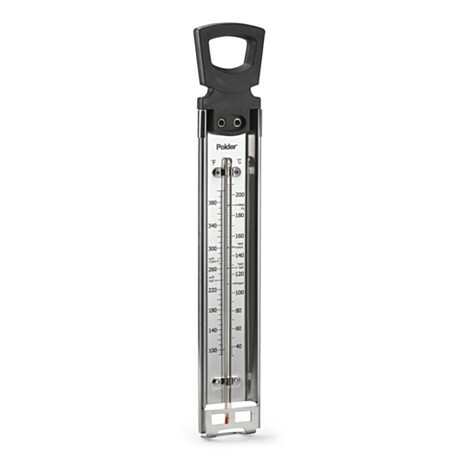 I was wondering if you could recommend a candy thermometer that will work the best? I am on a budget but willing to spend a little extra. Also, is there anything else I might need to get started? Please let me know and I love your blog! Back in the day, before the advent of commercial home thermometers, a "water test" method was used to inform cooks about their candy. This requires the cook to pop a small amount of the hot candy into a bowl of cold water and then feel the candy with their fingers to predict it's "done-ness". However, even for advanced candymakers the method was inaccurate as a taffy can quickly become a hardcandy. Candymakers stepping away from cooking batches to test if their candy was complete would often burn batches. But now that we have access to thermometers, which ones are the best? I like the classic metal stem thermometers that have an insulated plastic handle, grip top so you can remove it safely and quickly. They are about $10 and I find them easiest to use. The kind to look for should have a clip on the back to secure it to your pan and the numbers should be legible before you do any cooking with it. There is a difference often between these basic thermometers. If comparing a few, do get the "heaviest" stainless steel kind as I have found those tend to hold up longer than the lightweight models. Also, get one that has RED color in the glass bulb as they are the easiest to read, especially if you have hot, dark carmel dripping from your thermometer. The temp on the thermometer should range from 100-400°F for candy as most of your cooking is happening between 250-350°degrees. An accurate thermometer should read 212°F in vigorously boiling water. To test, hold the thermometer in the water and take your reading. If your current thermometer is off, you can mark your thermometer accordingly with permanent marker. Or better, treat yourself to a new one and make sure you test your new one once you get it home. Return it straight away if it does not pass the test. I do not recommend probes and/or thermometers with temperature sensors for candy making. They are too burdensome and I have not found them to be accurate. An accurate basic thermometer is really important, vital even, when making candy. You will be amazed at what you can make with one. Go forth and cook candy.